Cover image courtesy of Hachette Australia. Design by Beatriz Castro, illustration by Jim Madsen. ‘I know everything about this world’, declares Jessica Townsend in an interview with Publisher’s Weekly. Which world is she talking about? The world of Wintersea and the Free State; the world inhabited by Morrigan Crow, chief protagonist in Townsend’s new fantasy series, Nevermoor. In addition to these tangible elements, fantasy authors need to envision the moral framework that governs their created world and the values that underpin it. What principles will determine issues of right and wrong, of justice, of the exercise of power? Will their world operate within the boundaries of a belief system? Will myths and stories from the imagined world’s past (or from other, known worlds) influence the present? 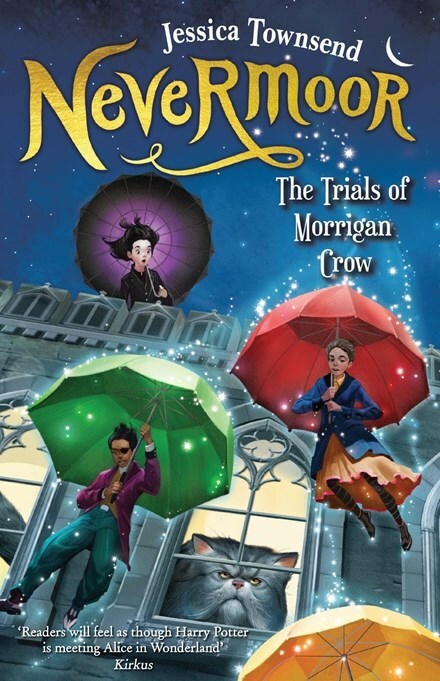 In Nevermoor: The Trials of Morrigan Crow, Jessica Townsend begins to reveal the world she has created for her debut series. Very briefly, Morrigan Crow, an eleven-year-old, cursed child, is facing imminent death—a fate that awaits all children born on Eventide. Her family is resigned to her demise, perhaps even welcoming the shedding of an awkward burden. But Morrigan is offered an alternative, albeit uncertain, future. She departs Wintersea under the care of her newly emerged patron, Jupiter North. Jupiter, a member of the Wundrous Society, runs Nevermoor’s Deucalion Hotel in the Free State. But entry into this realm is by invitation only. To remain there, Morrigan must compete with other children for admission to the exclusive Wundrous Society. Meanwhile, waiting in the wings, is the nebulous figure of Ezra Squall, who (like Jupiter) vies for the role of Morrigan’s patron. What clues does Townsend offer her readers to help them understand the moral shape of her imagined world? There are hints in the names of people and places, in the values that are affirmed, and in the exercise of power. Names: more than meets the eye? Morrigan Crow: Morrigan is the story’s main character. She shares her forename with an Irish goddess (who often appeared in the form a crow) whose name means ‘Great Queen’ or ‘Phantom Queen’. In Irish mythology, Morrigan is associated with power and sovereignty. Townsend seems to be offering her readers an insight into Morrigan Crow’s true nature and prospects. 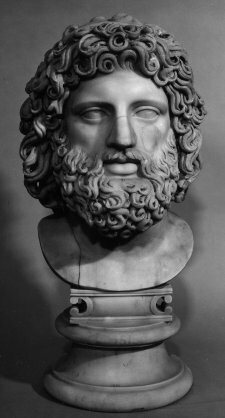 Marble head from a statue of Jupiter. British Museum. Character and place names help build a picture of the world Townsend is creating, a world where power is wielded, protection offered, and futures re-made. The Free State is renowned for ‘innovation, industry and thirst for knowledge’. Those who seek to qualify for membership of its highly selective Wundrous Society must manifest those characteristics via a series of trials that test them ‘physically and mentally’. In the Book Trial, candidates’ honesty is tested. Morrigan proves herself worthy through her ‘sincerity, reasoning and quick thinking’. The Chase Trial requires ‘daring, tenacity and an instinct for strategy’. The Fright Trial distinguishes ‘the bold from the meek’, exposing candidates’ courage and resourcefulness. Finally, the Show Trial reveals candidates’ talents or ‘knacks’. Interestingly, Morrigan learns that knacks are not regarded as candidates’ most significant quality. Jupiter explains that children with ‘fascinating knacks’ might be knocked out in the first three trials. The Wundrous Society Elders need to establish ‘what sort of person you are’ first. Readers of Nevermoor: The Trials of Morrigan Crow are not fully apprised of Jupiter North’s motives for bringing Morrigan into Nevermoor. (There are some clues and, no doubt, more will be revealed in the second book in the series.) In any case, Jupiter North is not the only one vying for control of Morrigan’s future and her latent power. There is also Ezra Squall to consider. Almost all fantasy worlds are underpinned by a battle between good and evil. Townsend’s world is no exception. For those acquainted with the New Testament, this offer will have a familiar ring. In accounts of the temptation of Jesus, the devil shows Jesus ‘the kingdoms of the world’, saying: ‘All this I will give you if you bow down and worship me’ (Matthew 4:8). If Morrigan aligns herself with Ezra, there is evidently much to be gained. Which side will Morrigan (and Townsend) choose? Remember Morrigan’s name means ‘Great Queen’—there will be power at her disposal, but how, and with whom, will she wield it? 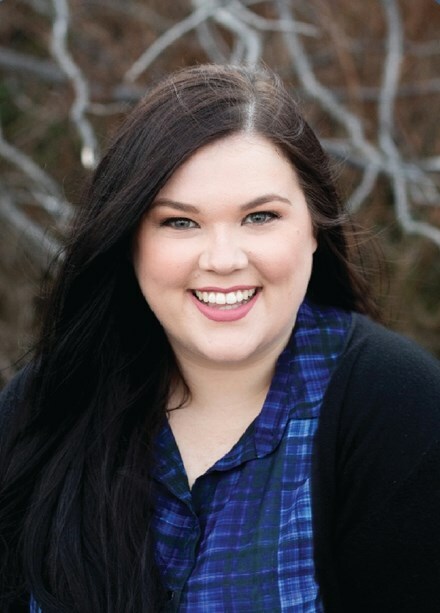 Jessica Townsend, Nevermoor: The Trials of Morrigan Crow. Published by Hachette Australia, 2017. Cover design by Beatriz Castro, cover illustration by Jim Madsen. Sue Corbett, ‘First Look: Jessica Townsend’s Nevermoor’, Publisher’s Weekly, 9 March 2017. Robyn Sheahan-Bright, ‘Teachers’ Notes’, Hachette Australia website. You can follow Jessica Townsend on Twitter and Instagram. There is a sample of Nevermoor: The Trials of Morrigan Crow here and some extra content (not included in the published book) here. Image credit: Marble head from a statue of Jupiter. British Museum. Reproduced under a Creative Commons Attribution-NonCommercial-ShareAlike 4.0 International (CC BY-NC-SA 4.0) license.